THE 80S - BREAKFAST TV IS BORN! 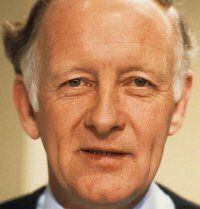 Do you remember waking up with Frank Bough and Selina Scott? Not literally, of course. But if you lived in the UK during the eighties you probably will have seen them on your TV screens, at least. I certainly remember watching TV-am on ITV just before I had to go to school, and getting a right rollicking for being late! Yes, breakfast telly had only just begun and was, therefore, a real novelty in the early eighties. On this page we have some really fabulous snippets from Eighties Breakfast TV. Before you leave the page, don't forget to play the videos in the playlist and relive those golden days of TV-am and the BBC's Breakfast Time. The BBC Breakfast Time team in 1983. 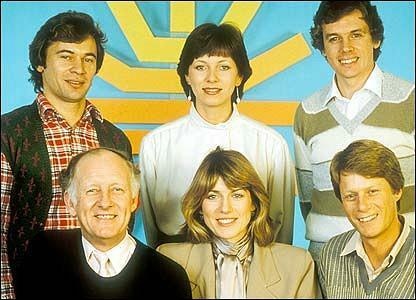 Top row; Weatherman Francis Wilson, Debbie Rix, David Icke, Bottom row; Frank Bough, Selina Scott and Nick Ross. This video clip in the playlist above features the launch of the first TV-am programme by the Famous Five (David Frost, Michael Parkinson, Angela Rippon, Anna Ford and Robert Kee) on 1st February 1983. This second clip really brings back some fond memories of my early morning breakfasts before rushing off to school - well I didn't exactly rush! Now, home time was a different matter. 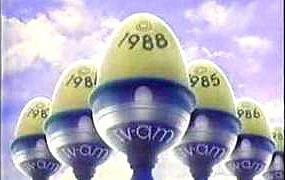 TV-AM was broadcast between 1st February 1983 and 31st December 1992. BBC Breakfast Time in January 1984. If you had a crush on Selina Scott then you can relive those moments again by watching the video above! The clip starts off with the last few moments of Ceefax. The BBC used to display selected pages before the real TV programmes started - more interesting that watching boring Bill Turnbull. Breakfast TV in 2014 - thank goodness for the gorgeous Susanna Reid, although she has now moved to ITV. In clip four Fern is discussing the sinking of the luxurious, Italian ocean liner the Andrea Doria in 1956 which killed 56 people. 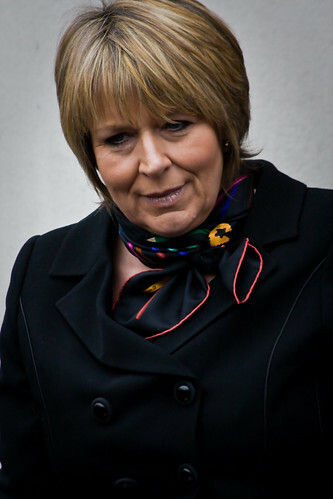 During the Autumn of 2012, Fern took part in BBC1's Strictly Come Dancing, although she was booted out after losing a dance-off with Girls Aloud singer Kimberly Walsh. Well, if they aren't leather then they are definitely rubber! In this clip she interviews Tim "Biggot" Smith. As I write, Debbie is a presenter on the QVC shopping channel. You either loved him or hated him! Yes, that blasted Roland Rat used to have a regular slot on breakfast TV just to annoy adults across the UK. 7. Margaret Thatcher gets frosty! 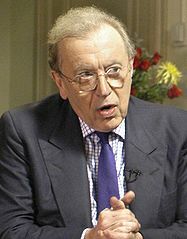 Clip 7 from 9th June 1985 features a heated exchange between David Frost and Prime Minister Margaret Thatcher while discussing the sking of the Belgrano during the Falklands War. What happens when the legendary carry-on comedy actor and controversial stand-up comedian find themselves on the couch together with Anne Diamond and Nick Owen? You'll be surprised! 9. Diana Dors, Nick Owen and lots of lard! In the ninth clip we see TV-am presenter Nick Owen and the lovely Diana Dors together in the kitchen discussing dieting and food. Released in 1960, Swingin' Dors was the only complete album that Diana Dors ever released. Clip 10 features an early Pet Shop Boys interview with Selina Scott which aired before the release of their Please album. Precaution! Chris Lowe actually has something to say! Whatever happened to Wincey Willis? Whatever happened to Gordon Honeycombe?